I have collected all of the 110 episode scripts available. In my quest to complete my personal library, I have collected boxes of duplicates, triplicates and sometimes more. I am selling these extras to help offset the costs of this web site and its contents. For names of the episodes, please click the Episode Guide button. One of the many boxes of scripts. 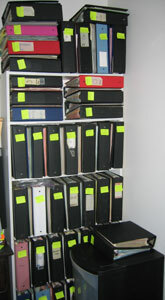 At left, more notebooks and boxes of scripts. I also have available a Pilot Comparison. It is a side-by-side comparison of the "Pilot" episode that aired 7/12/90 The comparison is the Revised First Draft of the script dated 2/15/90 and the Rev. Final Draft dated 4/27/90 thru 5/15/90. The side-by-side comparison of each page shows the changes made from first to final drafts of this episode. Can you imagine Marilyn with kids? Would it sound the same if Maggie's last name was "Casey"? The picture below shows the cover and the first two pages. Please email me from the link to the left with the name(s) of the script(s) you want and I can check the stack. I accept paypal and US money orders. I will ship anywhere in the world. Please email me with any questions. Serious inquiries only, please. Thank you! 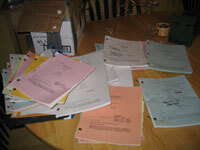 Also see ebay for scripts and other Northern Exposure items.